Living in the midwest you soon learn that some rather nasty storms can pop up at a moment’s notice. This past summer Wendy and I were witness to a small handful of storms that did considerable damage. It’s always disconcerting to survey the aftermath and find one house almost completely obliterated while the house next door appears to have no damage at all. I thought of those storm and the damage we witnessed as I read today’s chapter. Paul is in the custody of a Roman centurion making his way to Rome where he is to be tried in Caesar’s court. A terrible storm comes up threatening the lives of everyone on board the ship. Throughout the ordeal, Paul continues to assure the passengers that they will be okay. He urges them to keep up their courage and their physical health. Paul had received an angelic message assuring him that God’s purpose was that Paul stand before the Emperor, not die at sea. I couldn’t help but contrast the experiences of Paul with another famous sea-faring voyager, Jonah. In Jonah’s case, he was on the run and trying to escape his destiny. His reactions and responses amidst the storm are a stark contrast to Paul. This morning in the quiet I’m reminded of Jesus’ words: “[Your Heavenly Father] sends rain on the righteous and the unrighteous.” In other words, I can’t escape the storms of life. They will crop up when I least expect them and everyone has to weather them from time to time. The difference between Paul and Jonah, was in their purposes. Paul was sailing with purpose. He was on a mission, and he was confident that the storm was not going to alter his date with destiny. Jonah, on the other hand, was running away from God’s expressed purpose for him. I can’t stop the storms of life from raging, but the purpose with which I’m walking this Life Journey can make all the difference in how I weather them. Over the past 23 years I’ve been a business consultant specializing in customer satisfaction research and quality assessment. Some of the most enjoyable, long-term client relationships I’ve experienced are with companies who value the data and insight our team provides. When you see a client’s long-term improvement and success, it’s rewarding. What is not as enjoyable in my profession is to watch good people and good companies ignore data that offers them a hint of trouble on the horizon. Often, the data from our research or assessments warn of changing customer attitudes or internal corporate issues that threaten to create larger (and costly) problems for the company if the issues aren’t strategically addressed. It’s never fun or easy being the bearer of bad news, and even less fun watching insecure executives and managers burying or denying the data in an effort to avoid the issue. On occasion, I have to defend a sharp attack on our data and methods when a client really doesn’t like what our data reveals. The ancient prophets occupied a critical role in the Great Story that God is telling from Genesis to Revelation. Like spiritual consultants presenting a spiritual picture of what lay ahead, the prophets sounded the spiritual warning sirens of trouble on the horizon. When current circumstances had the government and public feeling good in the moment, the prophets often offered a bleaker picture of what was going to happen if certain issues were not addressed and strategic spiritual changes weren’t made. More often than not, the prophets had to watch as their message was ignored. They had to watch their warning of doom come to pass. They also endured sharp personal attacks from their audience. Some of them were even killed as scapegoats. This morning I’m thinking about the role of being a truth teller. It’s not always easy being the bearer of difficult or bleak news. Sometimes it feels like it would be easier to simply paint rosier pictures and ignore what we don’t wish to see or hear. But, we all need prophets in our lives. Sometimes we need someone to look us in the eye and tell us the truth we don’t want to hear. We’re better off when we find the wisdom and courage to heed the warning signs and make the necessary strategic decisions to avoid future problems. 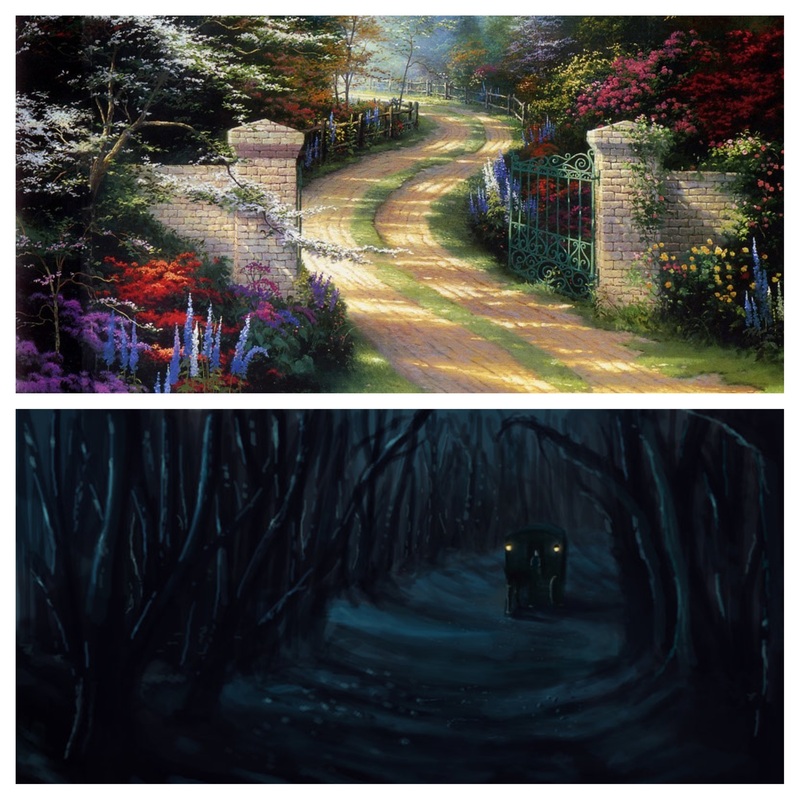 What we hope life’s road looks like (top) and what we sometimes find to be the reality (bottom). And now, as a captive to the Spirit, I am on my way to Jerusalem, not knowing what will happen to me there, except that the Holy Spirit testifies to me in every city that imprisonment and persecutions are waiting for me. One of the things that Wendy and I found fascinating about our time in Edinburgh a few weeks ago was that there’s hardly a straight, level street in the entire city. There are steep inclines, winding roads, angled streets, narrow alleys, and stairs upon stairs. We felt like we were constantly going up a steep hill or down a sharp incline. Our calves were killing us. That came to mind this morning as I read today’s chapter. I’m reminded that life’s path is not always easy, and the way does not always meander through pleasant, level places. The theme of Dr. Luke’s account of the first generation of Jesus followers if filled with difficulties, persecutions, executions, imprisonments, riots, shipwrecks, and floggings. And, time and time again Luke says that the Message flourished and daily the number of believers grew. I was a living example in my time with you. Follow it. I’m going to Jerusalem and expect to be persecuted and imprisoned. Be on guard! Wolves are going to infiltrate your flock. Give, and don’t expect anything in return. The message was followed by weeping and grief. It’s not exactly a Thomas Kinkade scene come to life. And, so it is with life’s journey. Sometimes the path leads through difficult terrain, but there is purpose in our pains and in the places God leads us. Paul wasn’t complaining about the road ahead. He may have felt fear and grief as he set out, but courage is not the absence of fear. Courage is the willingness to press on in spite of fear. Today, I’m thinking about the balance of hoping for the best while knowing that “the best” does not always look the way I want it to look.